John Chrysostom (/ˈkrɪsəstəm, krɪˈsɒstəm/; Greek: Ἰωάννης ὁ Χρυσόστομος), c. 349 – 407, Archbishop of Constantinople, was an important Early Church Father. He is known for his preaching and public speaking, his denunciation of abuse of authority by both ecclesiastical and political leaders, the Divine Liturgy of St. John Chrysostom, and his ascetic sensibilities. 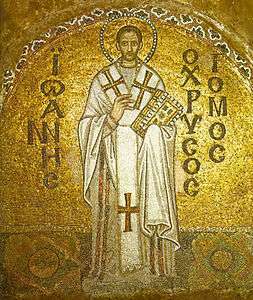 The epithet Χρυσόστομος (Chrysostomos, anglicized as Chrysostom) means "golden-mouthed" in Greek and denotes his celebrated eloquence. He is honored as a saint in the Eastern Orthodox, Catholic, and Anglican churches, as well as in some others. The Eastern Orthodox, together with the Byzantine Catholics, hold him in special regard as one of the Three Holy Hierarchs (alongside Basil the Great and Gregory of Nazianzus). The feast days of John Chrysostom in the Eastern Orthodox Church are 13 November and 27 January. In the Roman Catholic Church he is recognized as a Doctor of the Church and commemorated on 13 September. Other churches of the Western tradition, including some Anglican provinces and some Lutheran churches, also commemorate him on 13 September. However, certain Lutheran churches and Anglican provinces commemorate him on the traditional Eastern feast day of 27 January. The Coptic Church also recognizes him as a saint (with feast days on 16 Thout and 17 Hathor). John was born in Antioch in 349 to Greco-Syrian parents. Different scholars describe his mother Anthusa as a pagan or as a Christian, and his father was a high-ranking military officer. John's father died soon after his birth and he was raised by his mother. He was baptised in 368 or 373 and tonsured as a reader (one of the minor orders of the Church). 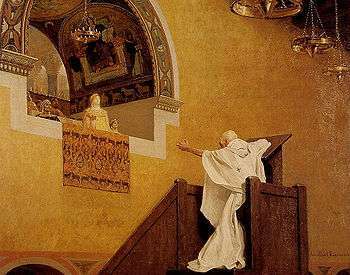 John Chrysostom confronting Aelia Eudoxia, in a 19th-century painting by Jean-Paul Laurens. For more details on this topic, see Meletian schism. His time in Constantinople was more tumultuous than his time in Antioch. Theophilus, the Patriarch of Alexandria, wanted to bring Constantinople under his sway and opposed John's appointment to Constantinople. Theophilus had disciplined four Egyptian monks (known as "the Tall Brothers") over their support of Origen's teachings. They fled to John and were welcomed by him. Theophilus therefore accused John of being too partial to the teaching of Origen. He made another enemy in Aelia Eudoxia, wife of Emperor Arcadius, who assumed that John's denunciations of extravagance in feminine dress were aimed at herself. Eudoxia, Theophilus and other of his enemies held a synod in 403 (the Synod of the Oak) to charge John, in which his connection to Origen was used against him. It resulted in his deposition and banishment. He was called back by Arcadius almost immediately, as the people became "tumultuous" over his departure, even threatening to burn the royal palace. There was an earthquake the night of his arrest, which Eudoxia took for a sign of God's anger, prompting her to ask Arcadius for John's reinstatement. Peace was short-lived. A silver statue of Eudoxia was erected in the Augustaion, near his cathedral. John denounced the pagan dedication ceremonies. He spoke against her in harsh terms: "Again Herodias raves; again she is troubled; she dances again; and again desires to receive John's head in a charger", an allusion to the events surrounding the death of John the Baptist. Once again he was banished, this time to the Caucasus in Abkhazia. 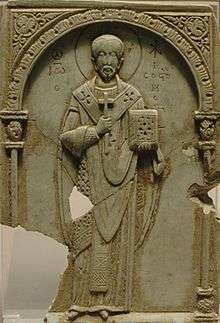 Around 405, Chrysostom began to lend moral and financial support to Christian monks who were enforcing the emperors' anti-Pagan laws, by destroying temples and shrines in Phoenicia and nearby regions. Faced with exile, John Chrysostom wrote an appeal for help to three churchmen: Pope Innocent I, Venerius the Bishop of Milan, and the third to Chromatius, the Bishop of Aquileia. In 1872, church historian William Stephens wrote, "The Patriarch of the Eastern Rome appeals to the great bishops of the West, as the champions of an ecclesiastical discipline which he confesses himself unable to enforce, or to see any prospect of establishing. No jealousy is entertained of the Patriarch of the Old Rome by the Patriarch of the New Rome. 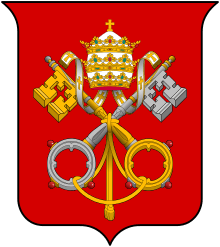 The interference of Innocent is courted, a certain primacy is accorded him, but at the same time he is not addressed as a supreme arbitrator; assistance and sympathy are solicited from him as from an elder brother, and two other prelates of Italy are joint recipients with him of the appeal." The return of the relics of St. John Chrysostom to the Church of the Holy Apostles in Constantinople. John wrote letters which still held great influence in Constantinople. As a result of this, he was further exiled from the Caucasus (where he stayed from 404 to 407) to Pitiunt (Pityus) (in modern Abkhazia) where his tomb is a shrine for pilgrims. He never reached this destination, as he died at Comana Pontica on 14 September 407 during the journey. His last words are said to have been "δόξα τῷ θεῷ πάντων ἕνεκεν" (Glory be to God for all things). John came to be venerated as a saint soon after his death. Three decades later, some of his adherents in Constantinople remained in schism. 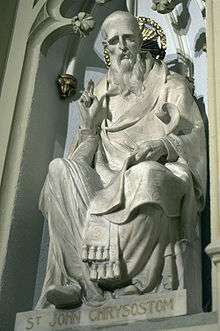 Saint Proclus, Patriarch of Constantinople (434–446), hoping to bring about the reconciliation of the Johannites, preached a homily praising his predecessor in the Church of Hagia Sophia. He said, "O John, your life was filled with sorrow, but your death was glorious. Your grave is blessed and reward is great, by the grace and mercy of our Lord Jesus Christ O graced one, having conquered the bounds of time and place! Love has conquered space, unforgetting memory has annihilated the limits, and place does not hinder the miracles of the saint." The Byzantine emperor Nicephorus III receives a book of homilies from John Chrysostom, the Archangel Michael stands on his left (11th-century illuminated manuscript). "If you ask [Christians] who is Amos or Obadiah, how many apostles there were or prophets, they stand mute; but if you ask them about the horses or drivers, they answer with more solemnity than sophists or rhetors". "Do you pay such honor to your excrements as to receive them into a silver chamber-pot when another man made in the image of God is perishing in the cold?" John claimed that synagogues were full of Christians on the shabbats and Jewish festivals, especially of Christian women, because they loved the solemnity of the Jewish liturgy and enjoyed listening to the shofar on Rosh Hashanah, and applauded famous preachers in accordance with the contemporary custom. A more recent theory is that he instead tried to persuade Jewish Christians, who for centuries had kept connections with Jews and Judaism, to choose between Judaism and Christianity. Other important treatises written by John include On the Priesthood (written 390/391, it contains in Book 1 an account of his early years and a defence of his flight from ordination by Bishop Meletios of Antioch, and then proceeds in later books to expound on his exalted understanding of the priesthood), Instructions to Catechumens, and On the Incomprehensibility of the Divine Nature. In addition, he wrote a series of letters to the deaconess Olympias, of which seventeen are extant. Beyond his preaching, the other lasting legacy of John is his influence on Christian liturgy. Two of his writings are particularly notable. He harmonized the liturgical life of the Church by revising the prayers and rubrics of the Divine Liturgy, or celebration of the Holy Eucharist. To this day, Eastern Orthodox and Eastern Catholic Churches of the Byzantine Rite typically celebrate the Divine Liturgy of St. John Chrysostom as the normal Eucharistic liturgy, although his exact connection with it remains a matter of debate among experts. Christian clerics, such as R.S. Storr, refer to him as "one of the most eloquent preachers who ever since apostolic times have brought to men the divine tidings of truth and love", and the 19th-century John Henry Newman described John as a "bright, cheerful, gentle soul; a sensitive heart." John's liturgical legacy has inspired several musical compositions. Particularly noteworthy are Sergei Rachmaninoff's Liturgy of St. John Chrysostom, Op. 31, composed in 1910, one of his two major unaccompanied choral works; Pyotr Tchaikovsky's Liturgy of St. John Chrysostom, Op. 41; and Ukrainian composer Kyrylo Stetsenko's Liturgy of St. John Chrysostom. Arvo Pärt's Litany sets Chrysostom's twenty-four prayers, one for each hour of the day, for soli, mixed choir and orchestra. James Joyce's novel Ulysses includes a character named Mulligan who brings 'Chrysostomos' into another character (Stephen Dedalus)'s mind because Mulligan's gold-stopped teeth and his gift of the gab earn him the title which St. John Chrysostom's preaching earned him, 'golden-mouthed': "[Mulligan] peered sideways up and gave a long low whistle of call, then paused awhile in rapt attention, his even white teeth glistening here and there with gold points. Chrysostomos". A late medieval legend (not included in the Golden Legend) relates that, when John Chrysostom was a hermit in the desert, he was approached by a royal princess in distress. 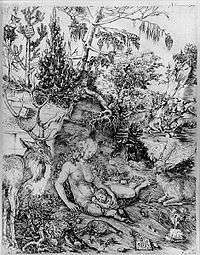 The Saint, thinking she was a demon, at first refused to help her, but the princess convinced him that she was a Christian and would be devoured by wild beasts if she were not allowed to enter his cave. He therefore admitted her, carefully dividing the cave in two parts, one for each of them. In spite of these precautions, the sin of fornication was committed, and in an attempt to hide it, the distraught saint took the princess and threw her over a precipice. He then went to Rome to beg absolution, which was refused. Realising the appalling nature of his crimes, Chrysostom made a vow that he would never rise from the ground until his sins were expiated, and for years he lived like a beast, crawling on all fours and feeding on wild grasses and roots. Subsequently the princess reappeared, alive, and suckling the saint's baby, who miraculously pronounced his sins forgiven. This last scene was very popular from the late 15th century onwards as a subject for engravers and artists. 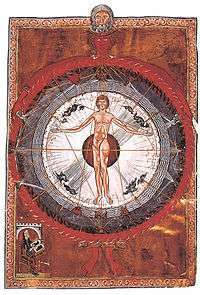 The theme was depicted by Albrecht Dürer around 1496, Hans Sebald Beham and Lucas Cranach the Elder, among others. Martin Luther mocked this same legend in his Die Lügend von S. Johanne Chrysostomo (1537). The legend was recorded in Croatia in the 16th century. The skull, however, having been kept at the monastery at Vatopedi on Mount Athos in northern Greece, was not among the relics that were taken by the crusaders in the 13th century. In 1655, at the request of Tsar Alexei Mikhailovich, the skull was taken to Russia, for which the monastery was compensated in the sum of 2000 rubles. In 1693, having received a request from the Vatopedi Monastery for the return of St John's skull, Tsar Peter the Great ordered that the skull remain in Russia but that the monastery was to be paid 500 rubles every four years. The Russian state archives document these payments up until 1735. The skull was kept at the Moscow Kremlin, in the Cathedral of the Dormition of the Mother of God, until 1920, when it was confiscated by the Soviets and placed in the Museum of Silver Antiquities. In 1988, in connection with the 1000th Anniversary of the Baptism of Russia, the head, along with other important relics, was returned to the Russian Orthodox Church and kept at the Epiphany Cathedral, until being moved to the Cathedral of Christ the Saviour after its restoration. Today, the monastery at Vatopedi posits a rival claim to possessing the skull of John Chrysostom, and there a skull is venerated by pilgrims to the monastery as that of St John. Two sites in Italy also claim to have the saint's skull: the Basilica di Santa Maria del Fiore in Florence and the Dal Pozzo chapel in Pisa. The right hand of St. John is preserved on Mount Athos, and numerous smaller relics are scattered throughout the world. ↑ The exact date of John's birth is in question, and dates between 344 and 349 are given. In the most recent general biography of Chrysostom, eminent patristics scholar JND Kelly, after a review of the evidence and literature, favours 349 as the date that best fits all available evidence, in agreement with Robert Carter. See Kelly, Golden Mouth: The Story of John Chrysostom: Ascetic, Preacher, Bishop, (Grand Rapids: Baker Academic 1998: originally published Ithaca: Cornell University Press, 1995), p. 4 fn. 12; esp. Appendix B passim. For a discussion of alternatives presented in the literature, see Robert Carter, "The Chronology of St. John Chrysostom's Early Life", in Traditio 18:357–64 (1962); Jean Dumortier, "La valeur historique du dialogue de Palladius et la chronologie de saint Jean Chrysostome", in Mélanges de science religieuse, 8:51–56 (1951). Carter dates his birth to the year 349. See also Robert Louis Wilken, John Chrysostom and the Jews: Rhetoric and Reality in the Late Fourth Century, (Berkeley: University of California Press: 1983), p. 5. 1 2 3 "St John Chrysostom" profile, Catholic Encyclopedia (see here); retrieved 20 March 2007. ↑ The Encyclopaedia Judaica describes Chrysostom's mother as a pagan. In Pauline Allen and Wendy Mayer, John Chrysostom (pg. 5), she is described as a Christian. ↑ Wilken (p. 7) prefers 368 for the date of Chrysostom's baptism, the Encyclopaedia Judaica prefers the later date of 373. ↑ Cameron, Averil (1998) "Education and literary culture" in Cameron, A. and Garnsey, P. (eds.) The Cambridge ancient history: Vol. XIII The late empire, A.D. 337–425. Cambridge: Cambridge University Press, pg. 668. ↑ Philip Hughes, History of the Church, Sheed and Ward, 1934, vol I, pp. 231–232. 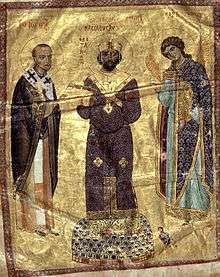 1 2 "St John Chrysostom the Archbishop of Constantinople". Orthodox Church in America. Retrieved 29 March 2007. ↑ Socrates Scholasticus, op cit "Chapter XVIII: Of Eudoxia's Silver Statue", p. 150. 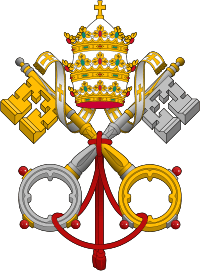 ↑ Vatican Library webpage; accessed 20 June 2015. ↑ Appeal to the Pope, earlychurchtexts.com; accessed 20 June 2015. ↑ St Gaudentius profile, newadvent.org; accessed 20 June 2015. ↑ The Divine Liturgy of St. John Chrysostom. Primedia E-launch LLC. 1980. pp. 8–9. ISBN 978-1-61979-382-8. ↑ Barker, Jason (2005). "Pascal Homily". Be Transformed. 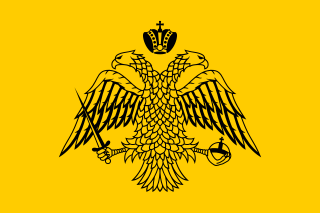 Antiochian Orthodox Christian Archdiocese of North America, dept. of Youth Ministry. Retrieved 17 November 2009. 1 2 "John Chrysostom" profile, Catholic Encyclopaedia Online, newadvent.org; retrieved 20 March 2007. ↑ "John Chrysostom" profile, Encyclopaedia Judaica. ↑ Wilken, Robert Louis. John Chrysostom and the Jews: Rhetoric and Reality in the Late Fourth Century (1983), University of California, Berkeley Press; ISBN 978-0-520-04757-0, pp. 124–126. Cited in CCL 2.0 at "John Chrysostom" profile, New World Encyclopedia; retrieved 25 October 2011. ↑ Kirsch, Johann Peter (1911). "St. Olympias". Catholic Encyclopedia. Robert Appleton Company. Retrieved 17 November 2009. ↑ Chrysostom, John. Hom. in Mt. 19,5: pp. 57, 280. ↑ Newman, John Cardinal, "St. Chrysostom" profile, The Newman Reader, Rambler: 1859 available online (see esp. chapter 2); retrieved 20 March 2007. ↑ "The Divine Liturgy of St John Chrysostom, Op 31". Hyperion Records, Ltd.
↑ "Litany". www.arvopart.org. Retrieved 15 April 2014. ↑ A variant relates that this was Genevieve of Brabant, wife of Count Siegfried of Treves, who was unjustly accused of infidelity and sentenced to death. She was led into the forest to be put to death, but her executioners relented and there abandoned her. ↑ "Legend of St John Chrysostom", Zgombic Miscellany. 16th-century Glagolitic manuscript [in Croatian Church Slavonic]. Zagreb, Archive of the Croatian Academy of Sciences and Arts. Shelf-mark VII 30. pp. 67–75. ↑ Pope John Paul II. "Letter to the Ecumenical Patriarch of Constantinople, His Holiness Bartholomew I". Retrieved 30 March 2007. ↑ Relics of St. John Chrysostom at the Church of St. George, Istanbul, cbc.ca; retrieved 13 September 2010. ↑ "Thousands queue outside Cyprus church after reports of miracle-working relic". International Herald Tribune. 13 November 2007. Retrieved 20 June 2015. Wikimedia Commons has media related to John Chrysostom.